Glucose-6-Phosphate Assay Kit (Colorimetric) (ab83426) is a simple, sensitive and rapid test to quantify glucose-6-phospate (G6P) in a variety of samples. In the assay, glucose-6-phosphate is oxidized into an intermediate product which in turn converts the probe into an intensely colored product with an absorbance at OD=450 nm. This product can detect G6P in the range of 1-30 nmoles with a detection sensitivity ~10 µM G6P. For higher sensitivity, we recommend our fluorometric assay Glucose-6-Phosphate Assay Kit - High Sensitivity (Fluorometric) (ab107923). Glucose-6-phosphate (G6P) is a key sugar intermediate for glucose to get into cells, and then enter either metabolic pathways or storage. G6P can enter the glycolytic pathway, the pentose phosphate shunt or be stored as glycogen or starch. 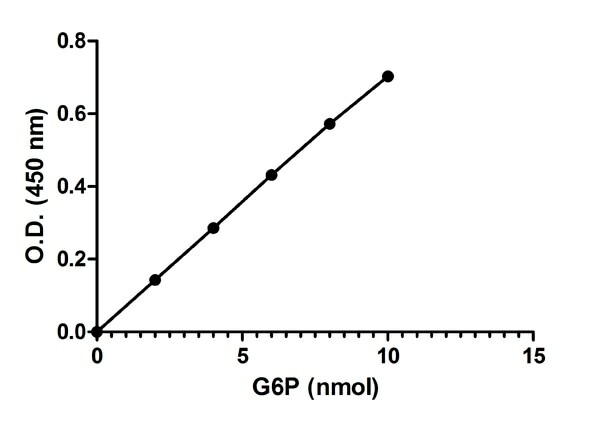 G6P is transformed by G6PDH to generate reducing equivalents in the form of NADPH. This is particularly important in red blood cells where a G6PDH deficiency leads to hemolytic anemia. Glucose 6 phosphate (G6P) is a key sugar intermediate for glucose to get into cells, and then enter either metabolic pathways or storage. G6P can enter the glycolytic pathway, the pentose phosphate shunt or be stored as glycogen or starch. G6P is utilized by its dehydrogenase to generate reducing equivalents in the form of NADPH. This is particularly important in red blood cells where a G6PDH deficiency leads to hemolytic anemia. Functional Studies - Glucose 6 Phosphate Assay Kit (ab83426)Image from Taylor KM et al., PLoS One. 2013;8(2):e56181. Fig 6(A). ; doi: 10.1371/journal.pone.0056181. 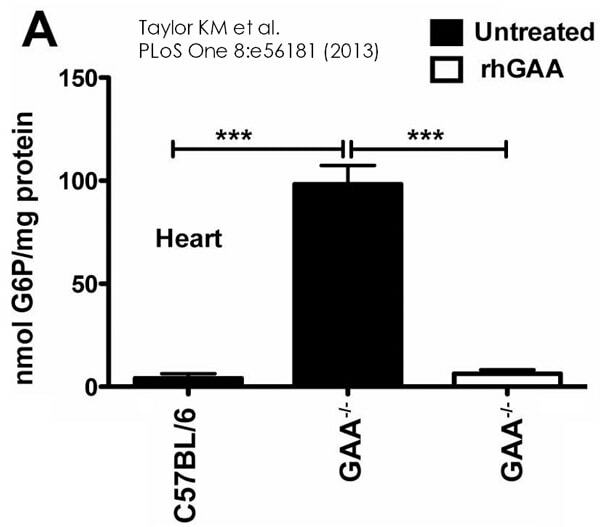 G6P (A) levels are elevated in GAA−/− mice compared to wild type (C57/Bl6) and reduced by rhGAA treatment. GAA−/− mice were dosed with rhGAA. G6P was quantified in heart and triceps homogenates from wild type (C57Bl/6) and GAA−/− mice using ab83426. Values are means ± SEM. Data was analyzed by one-way ANOVA followed by Newman-Keuls comparing groups. ***P<0.001. Colorimetric standard curve: mean of duplicates (+/- SD) with background reads subtracted. Publishing research using ab83426? Please let us know so that we can cite the reference in this datasheet. I am planning to use the Glucose 6 Phosphate Assay Kit (ab83426). My samples are blood. This is a colorimetric assay and in your protocol mention "Liquid or solution samples can be assayed directly"
Could you tell me how should I prepare my sample? Or just the serum directly. Other samples are prepared in PBS. Is not the reaction different with the PBS samples compared with serum when we add 50 μl of the Reaction Mix? Can you explain please? Yes, you are correct that serum samples can be used directly. You can run a sample background control (omit Glucose 6 Phosphate Enzyme Mix from the reaction mix) with your serum samples and subtract the background OD from the sample readings. Could this G6P kit be used to analyze mannose 6 phosphate? I've heard back from the lab that this kit is specific for glucose 6 phosphate. The protocol for this kit recommends that for cell samples, 5 million cells should be rapidly homogenized with 2-3 volume of ice cold PBS or other buffer (pH 6.5-8). Do you have a recommended protocol or method for homogenization? To prepare the samples, we would recommend homogenizing the cells with a Dounce homogenizer, 10-50 passes while samples are on ice. Efficient lysis can be confirmed by viewing the cells under a microscope. I hope this information will be useful, but please let me know if you have any further questions or if there is anything else that we can do for you. Our user would like to order this product. Before order, he wants to check to some information. He will test with high concentration of detergent sample (5%). He worried about that interference in phosphate assay. 5 % detergent will affect the enzyme assay and is NOT recommended. He will test with high concentration of detergent sample. Please check this for our user. In order to give you an accurate answer to your question, could you please provide more details about the "high concentration of detergent"? What type of detergent and what concentration? Customer tested one kit: got no signal at all even not in the standard. Double checked all steps. Additionally, customer had also a 2nd vial of G6P substrate mix in the kit, labelled whole serum and ab104231. Resuspending this second vial gave a solution not pink as the first one, but dark red. Also with this substrate mix there was virtually no signal. There was some signal with 6nmol peaking however at 3 to 4 - not going further. Vielen Dank für Ihren Anruf vongestern. Ich habe unterdessen herausgefunden was passiert ist. In der Tat war das erste Substrat fehlerhaft. Wir hatten daher dieses Substrat in den betroffenen Kits ersetzt - mit dem neuen G6P substrate mix ab104231. Leider wurde dies fälschlicherweise einfach in das Kit getan, anstatt die Röhrchen umzutauschen. Der dunkelrote Substrat Mix (ab104231) ist der korrekte Mix. Wir werden Ihnen daher das erste Kit ersetzen - gleich mit einer neuen Lot Nummer. In Bezug auf das zweite Kit, können Sie wählen wie Sie vorgehen möchten: 1.) Sie benutzen das Kit wie vorgesehen, und benutzten nur den Mix ab104231. Falls dies doch nicht gute Resultate ergibt, werden wir es Ihnen auch ersetzen. 2.) Sie können uns das Kit zurücksenden, und wir senden Ihnen ein Neues oder geben Ihnen eine Gutschrift. Bitte lassen Sie mich auch wissen, ob Sie das Ersatzkit akzeptieren möchten und ob ich es an die gleiche Adresse wie die erste Bestellung senden kann. Könnten Sie uns auch die Rohdaten des Versuches mit dem zweiten Substrat Mix (ab104231) senden? Dies hätte nämlich gute Resultate geben sollen. Ich würde es daher gerne auch etwas genauer anschauen. Ich freue mich auf Ihre Antwort. What sample types should be de-proteinized? The protocol instructs to use either PBS for homogenization of samples, or perchloric acid to de-proteinize. Thank you for contacting us about the G6P assay kit today. I am waiting for the lab to reply regarding the perchloric acid de-proteinization protocol. Can you describe your samples to me? This step will be necessary for any cell lysate or tissue homogenate preparation. As an alternative, you may want to consider the 10kDa spin column, ab93349. We are currently unable to provide the perchloric acid kit, ab93299.